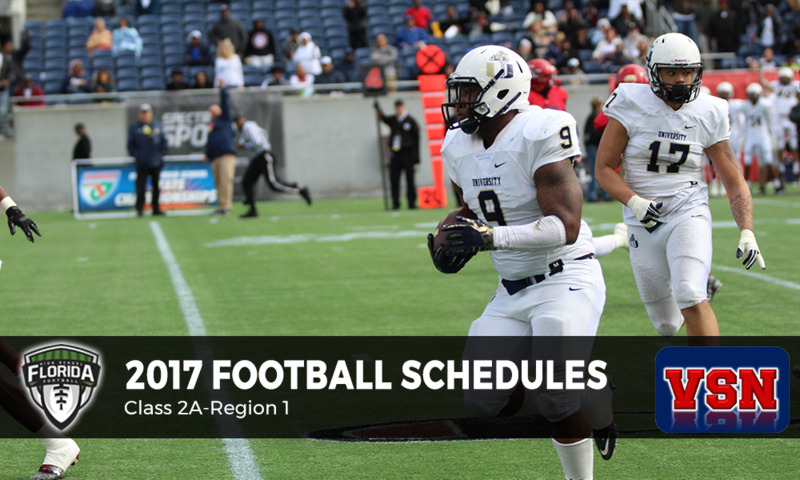 Here are the 2017 football schedules for Class 2A-Region 1, Presented by Varsity Sports Network. All kickoff times are 7:00 p.m. Eastern unless noted. • Week 0 — Fri. Aug. 18 — Georgia Christian, Ga.
• Week 1 — Fri. Aug. 25 — @ Pataula Charter, Ga.
• Week 10 — Fri. Oct. 27 — Snook Christian, Ala.
• Week 2 — Fri. Sep. 1 — @ University Christian, 7:30 p.m.
• Week 2 — Fri. Sep. 1 — @ Bell, 7:30 p.m.
• Week 1 — Fri. Aug. 25 — @ Franklin County, 7:30 pm. • Week 2 — Fri. Sep. 1 — @ Liberty County, 7:30 p.m.
• Week 5 — Fri. Sep. 22 — Jefferson County, 7:30 p.m.
• Week 8 — Fri. Oct. 13 — North Florida Christian, 7:30 p.m.
• Week 11 — Fri. Nov. 3 — Wewahitchka, 7:30 p.m.
• Week 1 — Fri. Aug. 25 — @ Bell, 7:30 p.m.
• Week 4 — Fri. Sep. 15 — Georgia Christian, Ga.
• Week 7 — Fri. Oct. 6 — Snook Christian, Ala.
• Week 1 — Fri. Aug. 25 — Snook Christian, Ala.
• Week 4 — Thu. Sep. 14 — @ Pataula Charter, Ga., 7:30 p.m.
• Week 1 — Fri. Aug. 25 — @ Deerfield-Windsor, Ga., 7:30 p.m.
• Week 2 — Fri. Sep. 1 — Valwood, Ga., 7:30 p.m.
• Week 4 — Fri. Sep. 15 — Snook Christian, Ala., 7:30 p.m.
• Week 5 — Fri. Sep. 22 — Providence, 7:30 p.m.
• Week 7 — Fri. Oct. 6 — Florida High, 7:30 p.m.
• Week 8 — Fri. Oct. 13 — @ FAMU DRS, 7:30 p.m.
• Week 9 — Fri. Oct. 20 — @ Jefferson County, 7:30 p.m.
• Week 11 — Fri. Nov. 3 — @ Port St. Joe, 7:30 p.m.
• Week 2 — Fri. Sep. 1 — @ Union County, 7:30 p.m.
• Week 5 — Fri. Sep. 22 — True Institute, Ga., 7:30 p.m.
• Week 8 — Fri. Oct. 13 — Foundation Academy, 7:30 p.m.
• Week 9 — Fri. Oct. 20 — @ Hamilton County, 7:30 p.m.
• Week 2 — Fri. Sep. 1 — @ Duval Charter, 4:30 p.m.
• Week 0 — Fri. Aug. 18 — @ Ben Lippen, S.C.
• Week 1 — Fri. Aug. 25 — Providence, 7:30 p.m.
• Week 2 — Fri. Sep. 1 — Cedar Creek Christian, 7:30 p.m.
• Week 3 — Fri. Sep. 8 — Crescent City, 7:30 p.m.
• Week 4 — Fri. Sep. 15 — @ Coffee, Ga., 7:30 p.m.
• Week 5 — Fri. Sep. 22 — @ Superior Collegiate, 6:00 p.m.
• Week 9 — Fri. Oct. 20 — @ Madison County, 7:30 p.m.